BEANO COMIC No 1 A FLYER AT £4401! 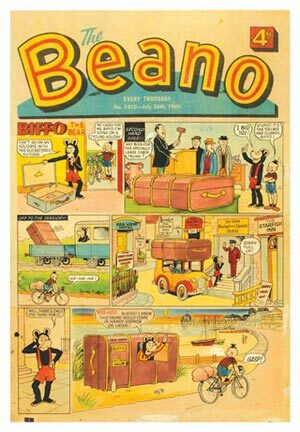 Our recent March auction was a 100% sell-out and the star item was this Beano No 1, unusually accompanied by its original ad which was in the form of a flyer and could be folded and cut to make a 4-page mini comic in its own right. 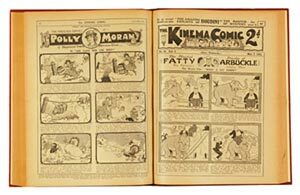 These flyers were inserted in DC Thomson's "Big Five" story papers: Adventure, Hotspur, Rover, Skipper and Wizard the week before the Beano's publication and they are just as rare as the comics themselves. In our May auction of last year a Very Fine copy went for £462. The flyer pictured above was in a lower grade with tan pages and some edge loss, and the comic itself had several margin tears, some cover foxing, lighter tan pages but was complete and made a mid estimate £4401 hammer price. We have now seen around fifteen first issues come on the market over the last fourteen years. 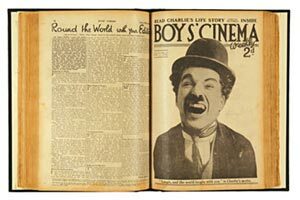 Charlie Chaplin, Douglas Fairbanks and Harry Houdini all starred in this first volume containing issues 1-28 with all free gift art plates. It was bid to £126 and represented somewhat of a bargain to the successful bidder who had placed a maximum bid of £210 to secure it. 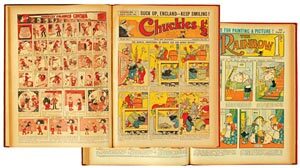 It is rare to find comics with First World War propaganda and these two bound volumes covering issues 26-77 from 1914-15 tried to cheer up the nation with their "Buck Up England - Keep Smiling" theme. Their added Fine grade took them to an above estimate £220. The first twenty bound issues of Rainbow from the same era featured wartime favourites Tiger Tim and The Bruin Boys and their exceptional Fine/Very Fine grades garnered a high £242. To put this into perspective the following lot featured a second bound volume of Rainbow in the same grades comprising issues 21-46 and this was sold for £88 highlighting the premium prices that No 1s and early issues can command. Not everything we feature goes for big money and sometimes the ads are more fun than the accompanying text. In this bound volume from 1921 a footballer, J Dimmock from "Tottenham Hotspurs" was looking distinctly uncomfortable in his All Wool Barry Sportscoat . 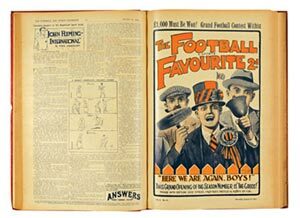 These ads are a world away from The Best A Man Can Get but life was simpler then and a copy of Football And Sports Favourite with your half-time orange was just the ticket in 1921. £99 was just the ticket for the winning bidder. 1921 issues 37-89 were offered in two bound volumes and starred Houdini: Master Of Mystery in each copy. The were magicked away for £264 and further (not-sawn in) half years from 1922 and 1923 reached £148 each without smoke or mirrors. 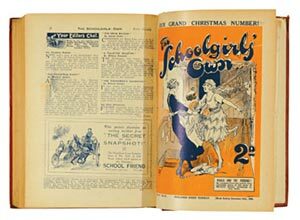 In 1921 Schoolgirl's Own was born and there is a strong collecting base for these early girls comics. Bound into a volume , issues 1-21 had their free gift art plates intact and reached an impressive £319. The following lot, illustrated above, and comprising numbers 22-48 was not far behind at £286. Hockey sticks were indeed jolly. 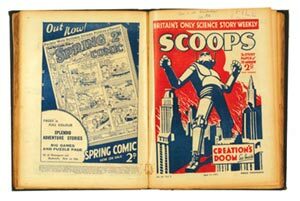 Britain's first science fiction weekly paper only ran for twenty issues and individual copies are very hard to unearth. This complete run, once more bound into a file copy volume, were stamped on each front cover and had some page edge brittleness (anathema to many collectors). However the rarity and completeness of the title, including Sir Arthur Conan Doyle's Poison Belt serial over five issues, prompted a £385 winning bid from a maximum bid of £480 and the successful buyer felt he had a genuine scoop. Radio Fun and Film Fun yearly volumes from the war years continue attract strong bidding and averaged an above estimate £200-240 a piece. 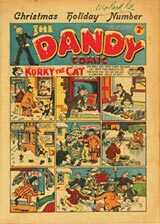 We featured Dandy early numbers 18-25 in single lots including the first Easter and April Fool issues and one bidder snapped up the whole run for between £55 and £66 each. He was not deterred by the fact that each copy had been extracted from a bound volume and had sew-holes and tears to the spine. The plus side was that the covers were unusually bright as the original binding had protected them from any colour fade. D C Thomson were no slouches when it came to marketing and even in 1941, when Christmas conveniently came between two Dandy publications, Thomson's headed them both as holiday numbers to maximise sales. So we had No 159 "Bumper Christmas Number" bid to £121, and number 160 "Christmas Holiday Number", illustrated above, bid to a strong £203, this double Xmas offering carried away by the same canny buyer. 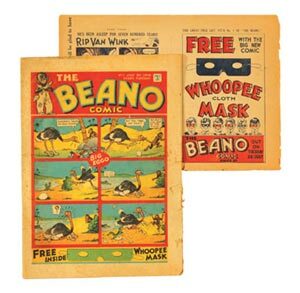 Not illustrated was lot 105, The Beano 452 from 1951. This Fine Minus copy starring Dennis The Menace's first adventure by Davy Law rose to a spanking new record of £313! 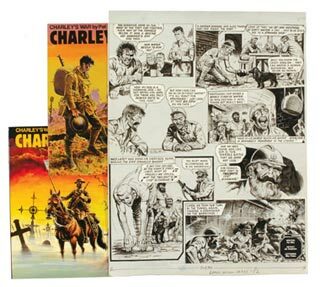 This set of artworks was a real rarity and showed Dudley Watkins prolific work in wash as well as ink. 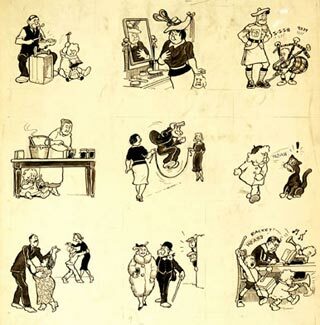 Nine small sketches of The Broons at home and at play would have been used as page headers and ads for the strip. As always, Watkins' mastery of the pen is in evidence and his complete understanding of perspective is realised as Daphne admires her new hat in the mirror, whilst keeping The Bairn in place with her other hand. All this in one wee sketch! Estimated at £300-350, the hard-fought winning bid was secured at £605. That wee lad won't be outdone and this 1944 New Year's travail where naebody wanted tae "first foot" Oor Wullie managed to end in a slap-up ginger wine cordial and shortbread treat: "Jings! Whit a great New Year I've had". So did the vendor of this piece as the bidding stopped at £997. 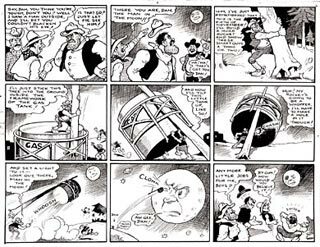 This early Desperate Dan artwork by Dudley Watkins had the Man In the Moon complaining as Dan gave him a black eye. £506 made the pain go away. 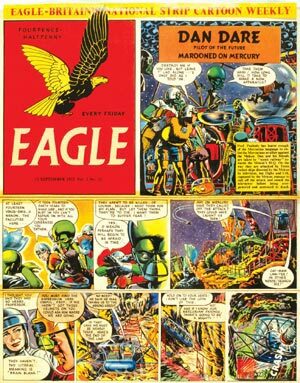 In this Marooned On Mercury artwork Digby is captured by the Mekon and sentenced to death; a Harold Johns and Gretta Tomlinsdon illustration beautifully proportioned with detailed moonscapes and contrasting panels of light and shade. £996 secured Digby's stay of execution. Biffo goes off to Brighton on his summer hols. He was never worried about living out of a suitcase but now he has to. Drawn and painted in 1969, this was one of Dudley Watkins last pieces as he died at the end of that year. The artwork did not reach its estimate of £1800-2300 and was sold for £1480 after the auction's close. Initially viewed by several potential bidders the colours were somewhat faded and this, aligned with the comparative lateness of the piece, may have been the reason. 348 Lion comics spanning the years 1963-1969 were sold in lots year by year and averaged £1.50 - 2.00 a copy in [vg/fn] grades. Some years ago we were auctioning Don Lawrence signed Trigan Empire artworks for an average of £250-350 a page. Since this wonderfully talented artist died two years ago this was the first piece to come up for auction with his signature and it commanded a successful bid of £495. Based on an anthology of soldiers' letters during WW1, Charlie and his friend, Blue were conceived by Pat Mills and based on fact. 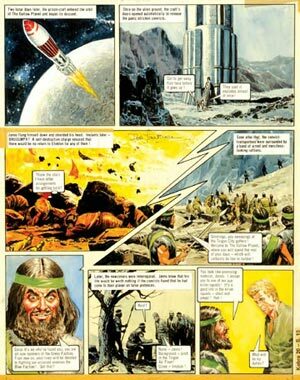 Blue's heroic exploits at Verdun were brilliantly illustrated by Joe Colquhoun for Battle-Action comic in 1980. This was the last of 3 pieces that we had consigned for auction and the two previous winning bids of £330 and £385 were dwarfed by the £827 that this final artwork achieved. Our US section was highlighted by two key titles: All-Star Comics #33 with Solomon Grundy cover reaching £400 in [vg+] and Showcase #8, the second Silver Age Flash appearance making £600 in the same grade. I visited the new Cartoon Museum near The British Museum the other day and enjoyed seeing the wonderful array of largely political illustration on offer. 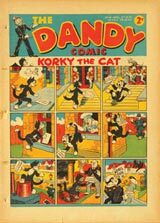 The surprise was that the comics artwork section was relegated upstairs at the back where some of the hilarious WW2 propaganda pieces of The Dandy's Desparate Dan, for example, would easily have stood their ground downstairs with the big boys of the national press. It reminded me of when I was a naughty kid years ago, sent upstairs to bed for answering back and reading my comics with a torch under the blanket.